While coal may be on the way out in much of Europe, a very different perspective prevails in an emerging economy such as Malaysia, where coal generation is seen as a key part of the fuel mix for the foreseeable future, providing reliable, stable, dispatchable and, above all, affordable power, regarded as crucial for sustaining growth. Exemplifying this is the Manjung coal fired power plant. Unit 4 at the site, which entered commercial operation in April 2015, was the first ultrasupercritical coal fired plant in south east Asia, and, at 1010 MWe net (1080 MWe gross), remains the largest such unit in terms of installed capacity. It is seen as a critical element in Malaysia’s energy diversification policy. Thus far, Manjung 4 has met or exceeded performance targets. As well as achieving high efficiency, over 40%, the plant has recorded excellent availability, particularly during its second year of operation, with an average of 94.5% availability over its first two years of operation, significantly above the target level. It has also achieved minimal unplanned down time, with an unplanned outage rate of 2.4% as of end August 2017, compared with a worldwide benchmark of 4%. The plant, owned and operated by Tenaga Nasional Berhad Janamanjung (TNB), was built (on an artificial island in the state of Perak, about four hours drive from Kuala Lumpur) by a consortium of GE (formerly Alstom) and CMC Engineering of China. It was constructed in under four years and delivered within budget. Three 700 MW Alstom (now GE) subcritical units entered commercial operation at the Manjung site in 2005, while a fifth unit, Manjung 5, employing 1000 MW class MHPS supercritical technology, went into commercial operation in 2017 (also owned by TNB, and located adjacent to unit 4, but having a separate management structure). For GE, Manjung 4 can be seen as a step in the evolution of its technology towards that employed in RDK8 (Germany), which has steam conditions of 275 bar/600°C/620°C and boasts a world leading efficiency of 47.5%, and the latest offering, SteamH, which promises an efficiency of 49.1%, with steam conditions of 330 bar/650°C/670°C. Manjung 4 employs T23 in its boiler but managed to avoid the problems with advanced alloys (in particular T24/T23) that have dogged ultrasupercritical coal fired power plants elsewhere, notably in Germany. 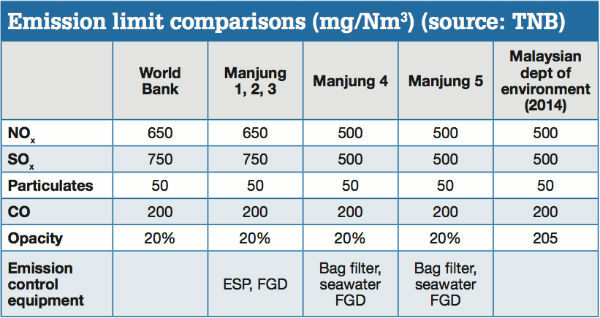 Manjung 4 burns low sulphur coal imported from Indonesia, and in conjunction with seawater flue gas desulphurisation, which achieves a 90% SO2 removal rate, achieves SO2 emissions levels as low as 200 mg/Nm3 (well below World Bank standards, see table below). predictably priced imported fuel is currently proving an attractive business proposition at Manjung, and is likely to remain so for a good many years to come.